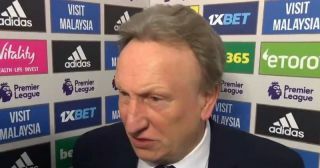 After Cardiff’s 2-0 win over Bournemouth on Saturday, boss Neil Warnock still wasn’t too happy as he had some choice words for Gary Lineker. Ahead of his post-match interview with Match of the Day, the Bluebirds boss wasn’t aware that the cameras were rolling and was caught taking an x-rated swipe at Lineker, as seen in the video below. Warnock was referring to Lineker calling him ‘Colin’, a rather unflattering nickname that he has had over the years with his name being an anagram of ‘Colin W****r’. However, he probably didn’t expect his response to be caught on camera, which has unsurprisingly since gone viral.